RoyalEnfields.com: MG Midget vs. Royal Enfield motorcycle; two of a kind? MG Midget vs. Royal Enfield motorcycle; two of a kind? Here's a 1979 MG Midget that regained its good looks. 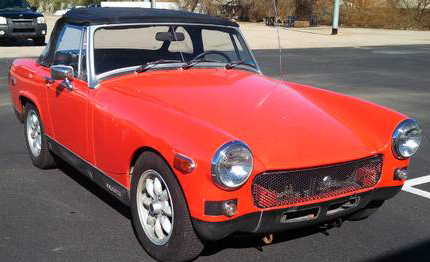 If you have a Royal Enfield C5 Military, the owner of a 1979 MG Midget in Buckeye, Ariz., is willing to trade. The MG has a new carpet and top and has been stripped of its ugly black safety bumpers. Even better, it has been restored to its European ride height. MGs imported to the U.S. in that era were jacked up to bring their bumpers into line with Department of Transportation regulations. They looked like shopping carts. The seller says it has 75,000 miles. Stripped of safety gear, this MG looks a lot like the 1966 Midget my brother Phil loaned me while he was in the Army. I drove it back and forth across the United States. In the process, I gained a lot of respect for the supposedly delicate British cars of the day. You got where you were going awash with pride at your accomplishment; never mind that you were just going to the grocery store. Every time the little motor sprung to life (assuming it did) you were in for an adventure. My 1999 Royal Enfield Bullet provides something of the same experience. If I had a C5 Military, I might not give it up for this pretty MG Midget. But I would think about it.